Hey everyone! We’re the Club Outreach team. Our names are Dan, Abi, Hannah and Joe. We love the students at Notts, and we as a Christian Union want to go where they are, and meet them where they’re at. That’s why, each Friday night, we head down to Ocean. Ocean is arguably the biggest Student Club Night in Nottingham, famously renowned for its Baywatch Anthem and the ‘Christians with Free Food’. 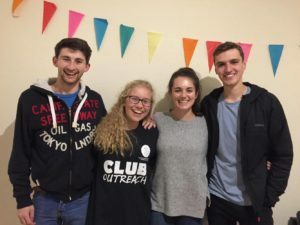 As Club Outreach, we are these ‘Christians with Freebies’ – we supply water, biscuits and sweets to those Ocean-goers, as well as helping them get home safely. In doing this, we aim to demonstrate Jesus’ extravagant love for each student. We long for every student to have the opportunity to come into contact with Christ, and often conversations and questions spring from this act of generosity. Over the years, we’ve had the privilege of seeing people come to know Jesus as a result of relationships formed through Club Outreach. Its a great way to make Jesus known to our fellow students, so if you want to get involved look out for the announcements in Equip, or come and speak to one of us personally!